The Pi-Phase mk2 is an accurate reproduction of the original Mu-Tron Bi-Phase dual phase-shifter, but in a more compact format much more suited to pedal-boards / live use. Note - ceased production as of January 2018; the last units are available from Axe And You Shall Receive (Canada) or Joe's Pedals (UK). The Rubber Fetish MkII is an old-school sounding envelope filter with extra features to make it usable in the studio or live in the modern age. 4ms triwave + digital delay, for out-of-this-world synthetic sounds. 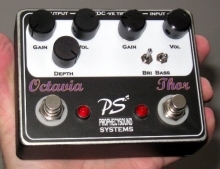 A reproduction of the 80's preamp / booster as famously used by The Edge. The Prophecysound Systems 'Seven-Seventy-Seven' is a faithful reproduction of the Flying Pan.